Rabbi in Mantua; born about 1643; died in 1722. Brieli, besides being a high Talmudical authority, as is shown in the responsa of his contemporaries Ishmael Coen, Morpurgo, and others who asked his opinion on halakic questions, was well versed in the secular sciences, which he zealously cultivated. Being highly esteemed by the Sephardic community of Amsterdam on account of his learning, his character, and his great age, he was asked by Ẓebi Ashkenazi (Ḥakam Ẓebi) and his followers for his support in their campaign against Ḥayyun and his cabalistic vagaries. Brieli, who was opposed to the Cabala in general, could have but little sympathy with Ḥayyun. He accordingly addressed two letters to Ḥakam Ẓebi (the first was published in "Milḥamot Adonai"), three to Ayllon, two to the board of the Amsterdam community, and one to Benjamin Finzi, in all of which he condemned Ḥayyun and approved the suppression of his book. Ḥayyun in his pamphlet against Ḥakam Ẓebi, entitled "Ha-Ẓad Ẓebi," says that Brieli is a Latinist and philosopher, but knows nothing about the Cabala; that he (Brieli) denies to Simeon ben Yoḥai the authorship of the Zohar; that he (Brieli), contrary to the Jewish law, has never married, and wears no beard. 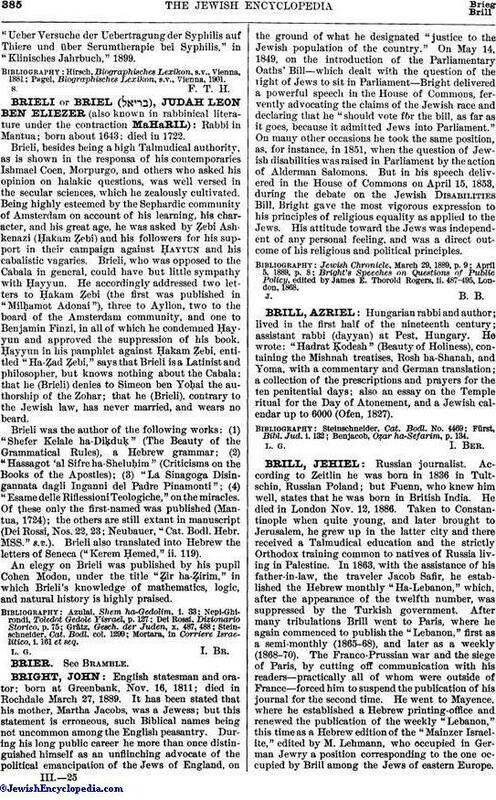 Brieli was the author of the following works: (1) "Shefer Kelale ha-Diḳduḳ" (The Beauty of the Grammatical Rules), a Hebrew grammar; (2) "Hassagot 'al Sifre ha-Sheluḥim" (Criticisms on the Books of the Apostles); (3) "La Sinagoga Disingannata dagli Inganni del Padre Pinamonti"; (4) "Esame delle Riflessioni Teologiche," on the miracles. Of these only the first-named was published (Mantua, 1724); the others are still extant in manuscript (Dei Rossi, Nos. 22, 23; Neubauer, "Cat. Bodl. Hebr. MSS." s.v.). Brieli also translated into Hebrew the letters of Seneca ("Kerem Ḥemed," ii. 119). An elegy on Brieli was published by his pupil Cohen Modon, under the title "Ẓir ha-Ẓirim," in which Brieli's knowledge of mathematics, logic, and natural history is highly praised. Mortara, in Corriere Israelitico, i. 161 et seq.